Having ancestors from Cork comes up time and time again when speaking with people in the American genealogy world. The names of these ancestors can sometimes be very 'Cork-like,' such as Cornelius Mahoney or Jeremiah Murphy. This came to mind when I wrote two of my recent posts (U.S. Census Series: Ward I, Boston 1860 and U.S. Naval Enlistment Records). In both, Cork has, by far, the largest representation from those who had their county of birth recorded. This is a potentially interesting observation and is worth looking at in more detail. Can we say that if you don't know where your ancestors are from, and you want to play the percentages game, then Cork is the best place to start looking? (i) about 10% of Irish people in the Naval enlistment records and 57% of Irish people in the Ward 1, Boston census returns recorded a place of birth. As this is the case, caution should be used before extrapolating any findings from the subset of records that record place of birth. (ii) these examples are just two record sets, one a point in time survey (census) from 1860 and the other (naval enlistment records) is a record set created via self-selection, as in some people chose to enlist, while others did not. (iii) while it can't be measured, a maxim I have learned is that leaving from Ireland via the port of Cobh (known as Queenstown from approx. 1849 to 1922) can sometimes turn into 'born in Cork,' as family stories are passed down through the generations. Despite all this, two interesting observations can be made if we look at statistics that can help with genealogical research. First, in the 1851 to 1880 period, county Cork had the largest number of emigrants leave Ireland (table one). Second, Cork had the largest population of all counties in the 1851 to 1881 period (table two). It could be inferred that the reason Cork had the highest number of emigrants was because it was the county with the largest population. However, Dublin was the second most populous county in the same time period but did not produce the second highest number of emigrants. A casual observation for Cork and Dublin could be there that there were less economic opportunities in a large rural county than in a predominantly urban one. However, the 'large population = lots of emigrates' trend re-emerges with Antrim, the county with the third highest population and home to the second largest city on the island, Belfast. So, to answer the question posed at the start: based purely on emigration numbers, probably, but even though Cork had the largest number of emigrants, that percentage is probably going to be small. 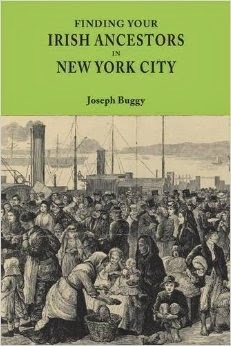 Miller, Kerby A. Emigrants and Exiles: Ireland and the Irish Exodus to North America. New York : Oxford University Press, 1985.
http://www.histpop.org/ohpr/servlet/PageBrowser?path=Browse/Census%20(by%20geography)/Ireland/1891&active=yes&mno=437&tocstate=expandnew&display=sections&display=tables&display=pagetitles&pageseq=13&zoom=4: accessed 14 May 2015.